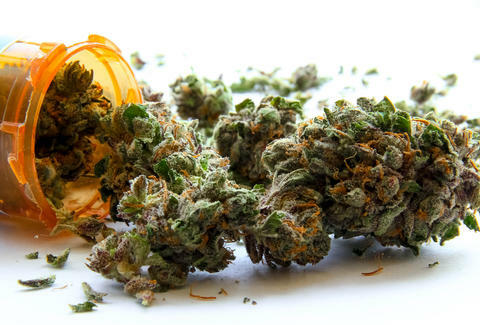 While marijuana practically sells itself (the legal stuff, of course), medical researchers have discovered yet another remarkable application for cannabis: it helps heal broken bones. Cannabidiol (CBD), a non-psychotropic (the part that doesn't get you high) component of cannabis, significantly improved healing bone fractures in tests involving rats with broken leg bones, according to a new study published in the Journal of Bone and Mineral Research by researchers at Tel Aviv University and Hebrew University. Obviously, people are reading that fun mag and High Times in tandem. After eight weeks, CBD "markedly enhanced the healing process" of the bones, even when separated from tetrahydrocannabinol (THC) in cannabis -- the stuff that does get you high -- researchers said in a press release. While some rats were treated with both CBD and THC, researchers said treatment with CBD alone does the job by, "enhancing the maturation of the collagenous matrix, which provides the basis for new mineralization of bone tissue," said Dr. Yankel Gabet of the Bone Research Laboratory at the Department of Anatomy and Anthropology at TAU's Sackler Faculty of Medicine. "After being treated with CBD, the healed bone will be harder to break in the future." But then again, if you were a rat with a broken leg, which test group would you want to be in? Authors of the study said they will continue additional research to see if CBD is useful for treating human bone fractures, too. Too bad you'd have to break a leg to find out. Tony Merevick is Cities News Editor at Thrillist, has never broken a bone, and doesn't plan on it. Send news tips to news@thrillist.com and follow him on Twitter @tonymerevick.